I received this audiobook as part of my participation in a blog tour with Audiobookworm Promotions. The tour is being sponsored by Mark Hosack. The gifting of this audiobook did not affect my opinion of it. The good spy is a fantastic read. With a thrilling Plot and Fantastic characters it was hard to put down. It is very well written and kept a good pace throughout. There were some great characters but ones that stood out was Jake Boxer. Without giving too much away I was very invested in his story and how he was going to solve his problem. 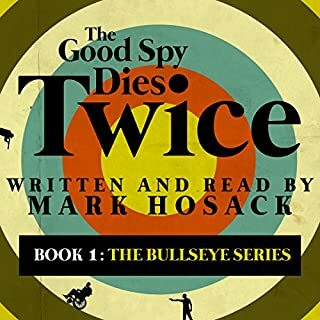 The audiobook was narrated by he author Mark Hosack. I thought he did a fantastic job. There was a great flow throughout the book. A good character distinction through most of it. Overall it translated quite well into a audiobook and had a great sound quality. While I have only listened to the audiobook, nothing has seemed to be lost in translation and was very enjoyable. In the end it was a excellent read. It was a fantastic start to the series and I cannot wait to find out what happens next in this series.